American Outlaws, Australia's hottest new show! After touring Australia nationally for over seven years and performing at over five hundred great shows in clubs and theatres from Nhulunbuy to Mt.Gambier, Perth to Brisbane and Bourke to Ceduna, Dail Platz now presents his latest touring show and tribute to the "Highwaymen". 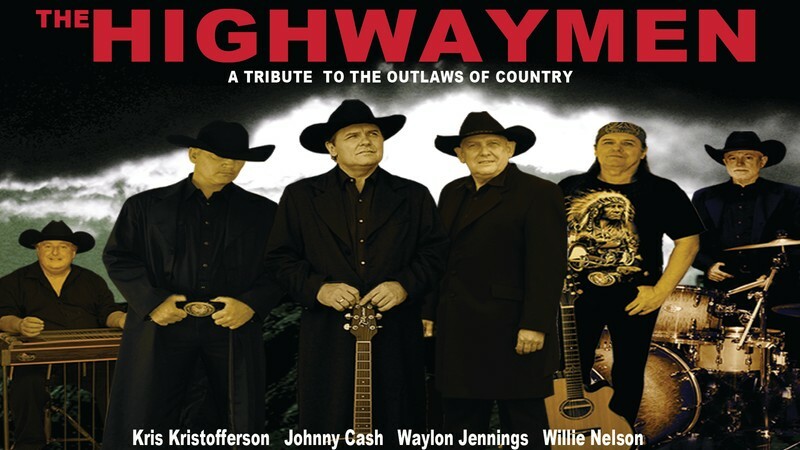 The show is largely based on the "Highwaymen – Live at Nassau Coliseum", a live concert recorded in 1990 which is considered "the Mt. Rushmore of country music". Dail's new show includes 28 songs from the concert as well as a few more of the band members biggest hits. Folsom Prison Blues, Ring Of Fire, Sunday Morning Coming Down, Amanda I Walk The Line, Ghost Riders In The Sky, Bobby McGee, Mommas Don't Let Your Babies, Against The Wind, Blue Eyes Crying In The Rain, Luckenbach Texas, Ramblin Man, Silver Stallion, Help Me Make It Through The Night, A Boy Named Sue, Good Hearted Woman, Seven Spanish Angels, City Of New Orleans, You Were Always On My Mind, The Highwayman, On the Road Again and many more—34 songs in all. Canadian-born Dail Platz is an international artist with a unique background. He performed in the true honky-tonks and bars of North America for many years before making the move to Australia. From a musical family, Dail grew up in the foothills of the Canadian Rocky Mountains with a house full of kids, guns, (for the bears) and musical instruments. There were banjos, accordians, mandolins, guitars, upright bass, washboard, juice harp, and spoons did double-duty. There were also usually a half dozen friends and relatives having a jam that quite often lasted till well after his bed-time. His dad was also a multi-instrumentalist and a great fiddle player. Dail still likes to include a few of those old tunes in his shows. Falling asleep to the sounds of the old country tunes of the day may be what still draws him to the great country songs of the past. Since arriving here in Australia Dail has created, produced and played a starring role in The Highwaymen Tribute Show, The Grand Ole' Opry Tribute, Johnny Cash Tribute with The Tennessee Two, The Alan Jackson Tribute Show and The Willie Nelson Tribute Show. These touring shows were all well received and Dail has won acclaim across Australia for the professional standard that was evident to everyone who attended. One of the outstanding features in all these shows is the incredible talent and versatility he displays both vocally and instrumentally, and with his obvious unrivaled skill playing acoustic and electric guitars, fiddle, mandolin and 5 string banjo, to name a few! It goes without saying that Dail is a perfectionist but beyond that he is also one of Australia's top entertainers. He has been quoted as saying that the patrons could stay home and listen to their home theatre if all they wanted was great sounding music. They come out to the shows to have a good time and be entertained. Producing the new, "Highwaymen Show" has been a labor of love. The show is all about the great music that has sold hundreds of millions worldwide and is only gaining in popularity. Many fans of the show believe it may be the best "Country Show" currently touring Australia.